The son of Finnish immigrants, right-handed pitcher Rudy Kallio forged a 21-year career in minor-league baseball and appeared in 49 big-league ballgames. He came from the Pacific Northwest, born in Portland, Oregon, on December 14, 1892. He graduated from Portland High School and began playing professional ball at the age of 20. Baseball gave him the opportunity to get around; in his first five seasons, he played for teams based in two countries – in four states and one Canadian province. The first season was with the Butte Miners in the Class D Union Association in 1913. He was 13-17 in 280 innings. Three years earlier Kallio had been working as a clerk in a railroad office at the time of the 1910 Census. His father, Mathias Kallio, was a carpenter and cabinetmaker who had arrived from Finland in 1882. His mother, Maria, came to the US two years later. They had five children as of 1910, with the eldest being Arthur, 25, a carpenter like his father. Rudolph was the second-born, eight years after Arthur. Eva, Edith, and Raymond followed. Whether the family was related to Kyosti Kallio, president of Finland from 1937 to 1940, we do not know. Rudy’s daughter-in-law Ann Kallio said that Rudy’s father was also a minister and that going into baseball was frowned upon and had to some degree estranged Rudy from the family. Kallio’s baseball career was often unremarkable. A web search of The Sporting News found a total of one innocuous reference to him between the years 1911 and 1931. More often, he turned up in the mainstream press, but the first significant story was “Rudy Kallio Whips Ducks,” in the September 9, 1916, Los Angeles Times. He was back home in Portland, pitching for the San Francisco Seals, and he struck out 13 Portland Beavers on the way to a 6-2 victory. The Beavers were sometimes nicknamed the Ducks. Kallio’s best game was a 4-0 shutout of the Yankees on June 15, in which he struck out eight and walked one, the “youthful wizard … of Russian descent” allowing just four hits. His worst moment was an August 6 game against the Boston Red Sox. Coming on in relief in the eighth inning, he was fine until the top of the tenth, when he gave up two walks, committed two errors himself, and was hit for a single. The resulting three runs gave the Red Sox a win. It was a war-shortened season in 1918, or Kallio would have received more work. 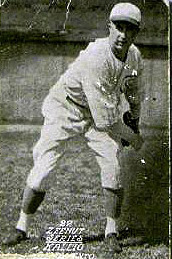 In 1919, the world war over, Kallio spent the full year with Detroit but appeared in only 12 games and 22 1/3 innings. He had no decisions, starting only one game, and putting up an earned-run average of 5.64. The Tigers finished fourth, Dauss was a 21-game winner, and both Howard Ehmke and Dutch Leonard joined Boland in comprising a decent staff that simply didn’t need Kallio as much as in the roster-depleted preceding season. In December he was released to Portland and was able to pitch the 1920 season there before many of the hometown folks. He threw 211 innings and was 9-10 with a 3.37 ERA. From this point on, into the mid-1930s and except for a brief return to the majors in 1925, Kallio pitched in the Pacific Coast League. He worked through May 1921 for Portland but was then dealt to Salt Lake City; 1921 was a 9-21 combined season, but he found a place to stay in Salt Lake, pitching with the Bees for most of five seasons, from 1921 into 1925. They were good seasons, too: 17-12, 14-9, and 18-14, in 1922, 1923, and 1924. Portland suffered a double defeat on June 23, 1922, when Kallio pitched two complete games in a doubleheader and beat the Beavers both times. There is a major-league record Kallio still holds, even in 2011: Most career wins without ever allowing a home run: 9. It’s a record he shares with Rube Kisinger (9-12 with Detroit in 1902-1903). Kallio spent most of 1925 back with the Bees, and was 8-5 (3.63). His final major-league line was 9-17, with a 4.17 ERA. In 1932 Kallio pitched for Seattle the full season and then appears to have retired, working as a ribbon salesman in a Portland department store. He was brought back to the Beavers, though, for another run and won his first seven games on his way to a very good year, 17-7 with a 3.41 ERA, in 1933. Then in 1934, his last full year, it was another combined Portland/Seattle season; Kallio began with Portland but was acquired by Seattle in a mid-June trade. It was his third stint for Seattle. In 1940 a Kallio popped up on the Portland team again – for just two games. It was Rudy’s son Jack, signed on February 10. In 2 1/3 innings over the pair of games, he was hammered for nine runs (eight earned) and a 30.86 earned run average. He was briefly with Boise in the Pioneer League in 1941, listed without details as appearing in just one game. Jack, Rudy and Eva’s only child, went on to become a longshoreman in Coos Bay, Oregon. Rudy Kallio’s minor-league record over all the years, 1913 through 1934, was 287-270. A true comprehensive ERA is impossible to determine. He did spend time in Portland working with neighborhood children on their pitching ability. At least one boy, John Linde, spent some time in the minor leagues. Whether Kallio returned to selling ribbons is unclear. Ann Kallio recalled him working as a floorwalker at the Meier and Franks department store in downtown Portland. At the time of the Second World War, he worked for the Willamette Iron and Steel Corp., presumably performing defense-related work. The year after the war, he worked as a scout for the Chicago Cubs. His obituary in The Sporting News said that he served for several years as coach and traveling secretary with the Portland Beavers. Rudy Kallio eventually sold the club and retired, moving to an apartment near Jack’s family in Waldport, Oregon. He suffered from prolonged illnesses and became frail, and perhaps understandably became a little bitter, ultimately dying of pneumonia on April 6, 1979. In addition to the sources noted in this biography, the author also accessed Kallio’s player file from the National Baseball Hall of Fame, the Encyclopedia of Minor League Baseball, Retrosheet.org, and Baseball-Reference.com. Thanks to John, Karen, and Ann Kallio. Her name is provided by Kallio himself in the questionnaire he completed for the Hall of Fame. The 1920 Census shows the couple living with her grandparents, Hans and Karen Rasmussen, both natives of Denmark. The Kallios’ son Jack was 1½ years old at the time of the census. Mathias and Maria Kallio were still living in Portland, with Mathias still working as a carpenter in a factory. New York Times, June 16, 1918. Russia conquered Finland during a war with Sweden in 1908-09, and was, in the words of the Ministry of Foreign Affairs (www.finland.fi), an “autonomous Grand Duchy. The Grand Duke was the Russian Emperor, whose representative in Finland was the Governor General.” Finland declared its independence from Russia after the Russian Revolution in 1917.